Markets have been pulling back since the beginning of March. This has brought US indexes back down to major support levels. The stage is now set for another push higher. Will we get it? S&P is once again trading North and South of the 2050 level, as it has been doing since November. The recent pullback could be coming to an end as the Earl indicator (blue line) has just turned up from a major low. The MoM indicator has reached pessimistic territory, a level typically seen at major buying opportunities. The slower Earl2 (orange line) is still heading down, but may go on to paint a shallow bottom. A rally towards 2150 or 2200 is quite possible with this setup. A decline below the important support at 2040 would invalidate this scenario and probably give us a serious drop. A climb above 2150 would make it increasingly likely that the red channel in the chart is the one to watch going forward. But that remains to be seen. 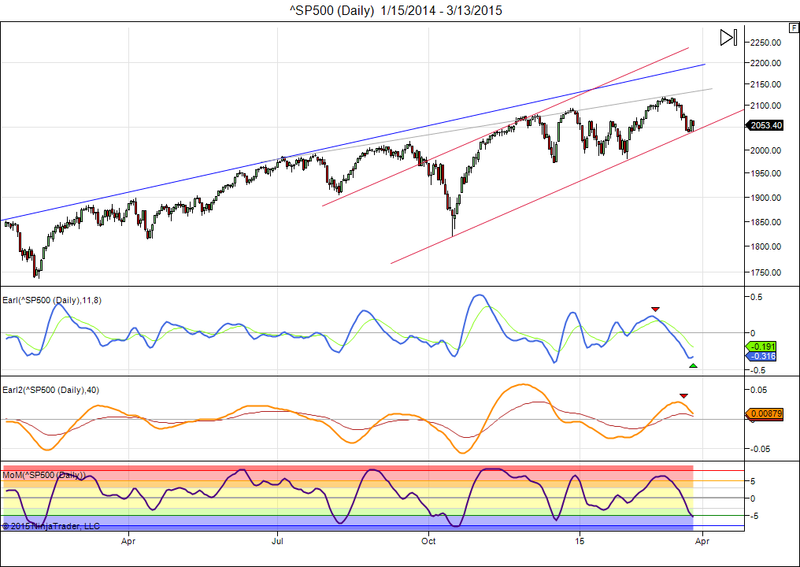 This entry was posted on March 16, 2015 at 11:04 am	and is filed under Financial Astrology, Market Commentary. Tagged: lunar cycles. You can follow any responses to this entry through the RSS 2.0 feed. You can leave a response, or trackback from your own site.